Sunday is typically pancake day in our house. Our girls are always extremely excited to know pancakes will be on their plates, and the morning is playful and relaxed unlike school mornings. These are a new recipe, made with whole-grain wheat-free flours and including Salba seed... hence being named Whole-Grain Salba Pancakes. Most often I use the ground salba - in smoothies, to sprinkle in oatmeal or cold cereals, etc, it's quite convenient to simply add to some foods you eat. But, with the pancakes, I wasn't fussy with the texture that the ground salba c ontributed, so I used the whole salba seed. I tweaked the recipe a few times, but now have a batter that yields a big ol' batch of fluffy, light pancakes that are very healthy for you. Now, when you get ready to drizzle some maple syrup over your stack of pancakes, you'd better be using pure maple syrup! I've had people ask if they can substitute imitation maple syrup in my recipes for cookies, etc, where I use pure maple syrup. I say never! Never use imitation maple syrup. Absolutely not in recipes, but also not on pancakes. Imitation maple syrup is full of artificial ingredients and tastes weird. You'll never go back once you try pure maple syrup... and, eventually you'll accept the extra cost, it's well worth it. Watch for when pure maple syrup goes on sale and stock up, okay?! And if you don't have kidlets eating pancakes and drizzling that maple syrup all over their plates, just think how much of that sticky-sweet-mapley goodness you'll actually save - ha! Yes, after pancakes, we have sticky fingers, sticky mapley-scented pj's, sticky kitchen table, the list goes on. One final note about Salba, here is a pic of some terrific Halloween Salba treats that you might find in your health food store. The treats are actually their rice krispy bars, but in miniature size. A healthy, fun alternative to all the sugary and dairy-laden candy that will be handed out. (btw, you might be wondering with all the Salba discussion on my blog whether I am sponsored or otherwise compensated by Source Salba. I am not, though I have received some sample products, much like what is offered in the monthly giveaways. I have used the whole and ground seed for some time now, and simply believe it is a healthful addition to a vegan diet. Some of my new recipes will therefore include Salba seed, and I am happy to share any product information that I think you will find interesting, such as these Halloween treats). I had no idea what salba was...thanks for the tip! Hi Sanja, maple syrup isn't cheap for sure, but usually we can get a 1 litre bottle for about $18, and sometimes about $16 if there's a good special on. Worth every penny, and not much different than if you buy a bottle of good wine - except it lasts longer, and is better on pancakes - ha! oops, Sanja, I meant the maple syrup is usually about $20 (Cdn), and we can get it for about $18 on special... I have no idea what the cost must be in the Netherlands... is it much more? Anyway... when the heck is Pancake Day? I say it needs to be SOON! Hey sis!! That's so cool, I had no idea you were into Salba, and also SO into those muffins... funny! I'll have to e-mail this Salba pancake recipe to you, and you can be a 'tester'!! btw, congrats on getting your pup - how lovely... how is he (she?) doing? I totally agree about the maple syrup... if anyone lives near a Trader Joe's, they have pretty reasonably priced pure maple syrup. 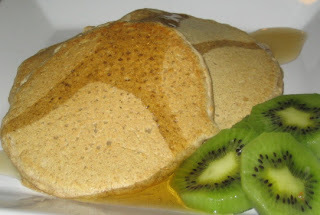 Your pancakes look delcious, and I love the kiwi idea! I would loooove to come over for some salba pancakes... those look delicious!! Salba sounds like something I should check out! Thanks. those look yummy Dreena - I also make some gluten free vegan pancakes using popped amaranth or cooked quinoa - as I can not afford Salba often - but it is fun to make healthy pancakes with all sorts of nutrients & protein in em - plus ABSOLUTELY must be pure maple syrup - I agree!! 1 litre maple syrup costs around 20 euros here in the Netherlands (so around 30 Canadian dollars). And I still think it is worth every penny (although I would definitely not mind if it became cheaper!). I'm not usually one for big breakfasts but I do like pancakes on a leisurely weekend morning or even for dinner on occasion. I will definitely have to try these. Can't wait for recipes from my other fave breakfast food- waffles!